Habit: Deciduous, shrub or small tree up to 6 m (20 ft) tall and up to 9 m (30 ft) wide; nitrogen-fixing actinorhi­zal (by the actinomycete Frankia) root nodules present. Reproduction: Primarily by seed; propagation by stump sprouting, by roots, and, for the Ellagood cultivar, by cuttings. 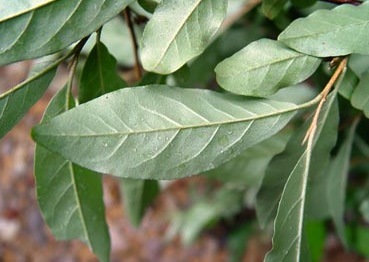 Leaves: Alternate, simple, oval, entire and wavy; gray-green, silvery scaly beneath, with a shimmering appearance; young leaves may be silvery on both sides. Stems: Twigs silvery or golden brown; often thorny with brownish scales, giving a speckled appearance. Flowers: Clusters of 1-8 in leaf axils; fragrant, tubular, cream to light yellow; April-June; exterior silvery-scaly; petals and stamens. Fruits/Seeds: Fruit 6-8 mm (1⁄4 in), fleshy, silvery with brown scales when immature, ripening to a speckled red or yellow; September-November; edible (bitter to semi-sweet); one seeded; dispersed by birds (not preferentially eaten) and water; fruit high in lycopene; cold stratification improves germination; optimal germina­tion at alternating temperatures of 20-30/10ºC (68-86/50ºF); persistent seed bank possible (seeds of E. angustifolia, a related non-native species, remain viable for 3 years in the lab and have a dormancy period); one study found that despite relative abundance of the species (compared to 31 years ago), E. umbellata seeds were not in the seed bank. 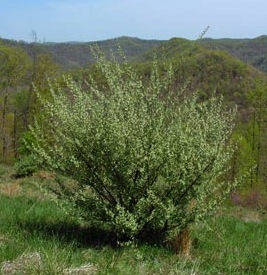 Habitat: Native to Asia; open woods, forest edges, roadsides, riparian areas, fence rows, meadows, pastures, sand dunes, mine spoils, other disturbed areas; possibly shade tolerant; tolerant of infertile and dry soils; acidic soils may reduce survival of seedlings; USDA hardiness zones 4-8. Comments: At least 5 cultivars; increases soil nitrogen, which may be beneficial to black walnut or have a negative impact by increasing invasion of other exotics or by changing ecosystem properties, neither of which is confirmed for this species yet. Similar Native Species: Silver-berry (E. commutata); but thornless with egg-shaped, shorter leaves that are silver-brown and scaly on both sides.